Koh Lan is the largest off-shore island situated to the west of Pattaya Strait, about 7.7 kilometers from the coast and it takes about 45 minutes by ordinary ferry and 15 minutes by speedboat. There are beautiful beaches, clear water, and an abundance of coral. Koh Lan is the largest off-shore island situated to the west of Pattaya Strait, about 7.7 kilometers from the coast and it takes about 45 minutes by ordinary ferry and 15 minutes by speedboat. There are beautiful beaches, clear water, and an abundance of coral. 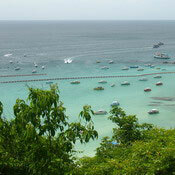 Koh Lan has many bays where visitors can view the coral either from a glass-bottom boat or by snorkeling. 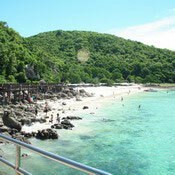 Haad Ta Waen in the northwest of the island is the longest and most popular beach on Koh Lan. This 750-metre-long beach has clear waters and white fine sand. 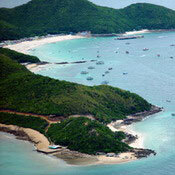 Haad Tian is located in the west of Koh Lan. This scenic beach in the cove stretches 500 metres long and features some coral reefs. Haad Sungwal is a small beach, only around 150 metres long. Without any shops or restaurant in the area, the beach is quieter than Haad Ta Waen and good for sunbathing.